Buying a gun safe is an effective way to store your firearms, but how do you protect the gun safe and the items inside it? Naturally, it’s going to be a target by burglars along with the valuable inside. However, you don’t have to be a victim. Try the following tips to protect your gun and gun safes. The greater your risk, the more sophisticated gun safe you’ll need. Again, you’re going to save money by investing in a quality gun safe. Be aware that vintage guns can fetch a good sum of money. If you have one or several of those, you need to secure them against theft. Insurance provides some level of protection against fire and theft. However, it’s not much use if the items don’t have the paperwork required to make a claim. Record your gun’s serial number, make, and model. Take a picture as well. Make at least two copies of these records. Store one of these copies outside your home, in a bank deposit box or another location. You can also upload these documents to an online cloud storage service. Update the content of the gun safe as you add and remove items. For insurance purposes, it’s critical you have the proper paperwork ready. Be aware that online information can also be stolen. Choose only a reputable company and change the password regularly. There is no need to choose between a digital and physical copy. For insurance information about your guns, keep both. Even if you have the best gun safe, it’s better to be safe than sorry. If you’ve got some valuable guns, insure them. If you’ve got a high priced firearm in your gun safe, your insurance company may ask you to pay a premium. Do it, because it’s cheaper to pay insurance in the long run. One of the most common mistakes made by gun owners is assuming their firearms are 100% secure in a gun safe. Gun safes are effective, but it’s better to insure in case the worst happens. There are two factors you need to balance, convenience and safety. Your gun should be easily accessible, but not to the point anyone can get it. Bolt the gun safe to a wall if possible. The instructions should be included in the manual. Get an electronic gun safe with glow in the dark readouts. This allows you to put the gun safe anywhere even if there’s no light. Make sure the gun safe is far from any flammable material. Use your gun only as directed. This is one of the most practical ways to ensure its longevity. Read your gun owner’s manual and follow the instructions for cleaning and maintenance. The best location for a gun safe is your bedroom. It should be near enough to access even if there’s an emergency situation. The bedroom is an obvious location. However, you can protect yourself by changing the combination locks frequently. With the Internet and social media, it has become more difficult to maintain your privacy. Follow these suggestions to maintain a low profile. De-list your phone number and home address. One of the reasons why some people get targeted is they unwittingly give up a lot of information online. Be responsible when posting pictures that might give away security details. Improving your home security system does two things. It reduces the risk of your gun being stolen and second, entitles you to insurance discounts. The amount and type of deduction you get varies. Consult your home insurance for more information. Implement these security features as soon as possible. Call your insurance once these measures have been put in place to get your discount. There’s a saying you get what you pay for, but it’s not always the case. Do some diligent research and you can get a good value gun safe. Buy a gun safe that can fit all the firearms and valuables you need. It is cheaper to buy a single, durable gun safe than a cheap one. Think of the long term. If you’re an avid gun collector, it’s better to buy a good sized safe now than purchase several. 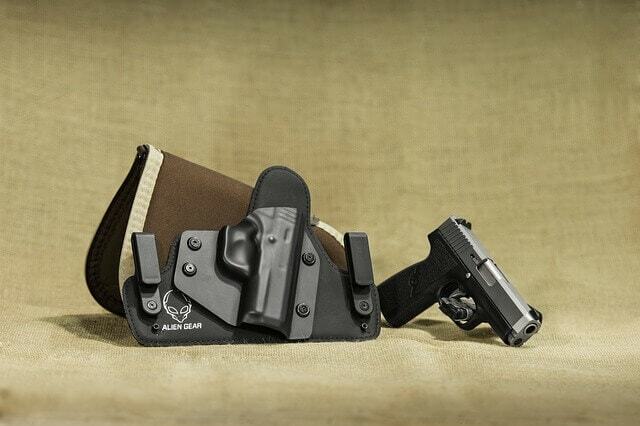 For handguns, a compact holder is a good enough security, and you can attach it under your desk for easy access. But if you have a lot of pistols, a large safe is more suitable. The safety provided by a gun safe increase its price. However, most retailers offer discounts so you can save money. Buying a gun safe is only the first step, as you also need to protect it against theft. With the information provided above you can rest easy knowing your guns are safeguarded without spending too much money.